The following articles appeared in the trade weekly in 1912. They show the impact this remarkable film had at the time. "Dante's Inferno was exhibited for the first time in France at the Cinema de Paris last Friday. 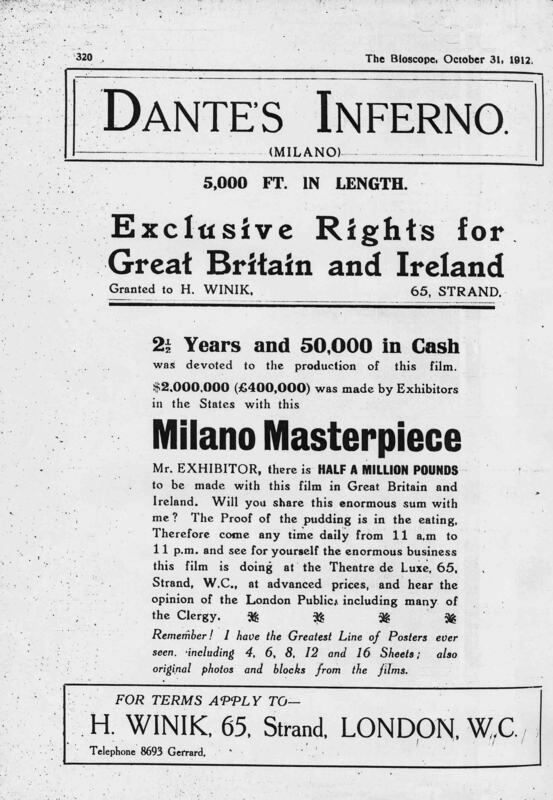 Mr. Brockway has given me some interesting information.............."
"The film of Dante's “Inferno,” produced by the Milano Company, is now being shown daily, from 11 a.m. to 11 p.m., at the Theatre de Luxe, 65, Strand, W.C. It was certainly a formidable undertaking to produce such a picture..........."